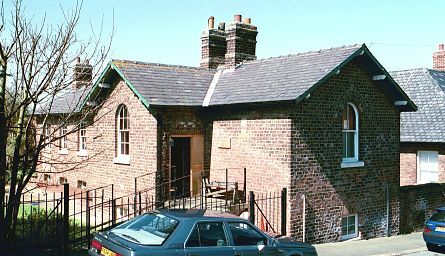 The first Whitby workhouse, funded by public subscription, was built in 1726-7 on Church Street. A parliamentary report of 1777 recorded a local workhouse in operation in the town for up to 70 inmates. In 1793-4, a new workhouse was erected off Green Lane at the south-east of the town. Being located near the entrance to Boulby's ropery, the site became known as The Ropery. The new building was L-shaped in layout as shown on a map of 1828. The Ruswarp parish workhouse, which was in use in 1834, stood at the west side of the town. North Riding of Yorkshire: Aislaby, Barnby, Barrowby, Egton, Ellerby, Fylingdales, Glaisdale, Goadland or Goatland, Hawkser with Stainsiker, Hinderwell, Lythe, Mickleby, Hutton Mulgrave, Newton Mulgrave, Newholm with Dunsley, Roxby, Ruswarp, Sneaton, Ugglebarnby, Ugthorpe, Whitby (3). Later Additions: Eskdaleside (from 1837), Helredale (from 1894). The population falling within the Union at the 1831 census had been 19,882 with parishes and townships ranging in size from Ellerby (population 64) to Whitby itself (7,765). The average annual poor-rate expenditure for the period 1834-36 had been £5,532 or 5s.7d. per head of the population. The new Whitby Union took over the existing workhouse in 1837. It layout in 1849 is shown below. In 1860, it was enlarged to about twice its size, forming a large U-shape. An entrance block was added at the south, and a school was also erected at the rear of the workhouse. The architects for the expansion scheme were John and William Atkinson of York who were responsible for a number of other Yorkshire workhouses including Bedale, Beverley, Easingwold, Goole, Howden, Pocklington, Skirlaugh and York. The workhouse location and layout are shown on the 1911 OS map below. Whitby main block from the south-east, 2001. Whitby rear of main block from the south-west, 2001. Whitby entrance block from the south-east, 2001. After the inauguration of the National Health Service in 1948, the former workhouse became St Hilda's Hospital and provided geriatric care. St Hilda's closed in 1978 and the surviving buildings are now occupied by small business units. North Yorkshire County Record Office, Malpas Road, Northallerton DL7 8TB. Very limited holdings include Guardians' minutes (1837-81). Whellan, T (1859), History and Topography of the City of York and the North Riding of Yorkshire .